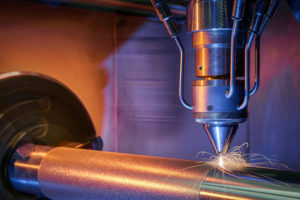 The new process for extreme high-speed laser depo­si­tion weld­ing (Ehla) is a gen­uine suc­cess sto­ry: inten­sive devel­op­ment in Aachen from 2012, con­sis­tent imple­men­ta­tion and test­ing of the sys­tem tech­nol­o­gy in the Nether­lands fol­lowed by indus­tri­al imple­men­ta­tion in Chi­na. And on 21 Sep­tem­ber 2018, the process devel­oped by the Fraun­hofer Insti­tute for Laser Tech­nol­o­gy ILT in Aachen and the Chair of Dig­i­tal Addi­tive Pro­duc­tion DAP at RWTH Aachen Uni­ver­si­ty in Ditzin­gen was award­ed the Berthold Leibinger Inno­va­tion Prize. Start­ing in 2000, the prize has been award­ed every two years for out­stand­ing research and devel­op­ment work on the appli­ca­tion or gen­er­a­tion of laser light. 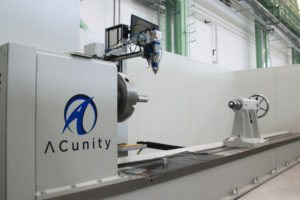 The instruc­tions for build­ing what is prob­a­bly the world’s fastest laser coat­ing sys­tem are actu­al­ly very sim­ple: take a CNC lathe and then install a laser beam source, a pro­cess­ing head and a pow­der feed sys­tem – and that’s it. This inge­nious use of addi­tive man­u­fac­tur­ing tech­nol­o­gy will be offi­cial­ly pre­sent­ed at EMO Han­nover 2019. The new process solves a prob­lem famil­iar to man­u­fac­tur­ers of high­ly stressed met­al com­po­nents in par­tic­u­lar. They have to coat com­po­nents to pre­vent cor­ro­sion or wear. 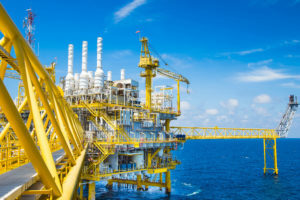 There are extreme­ly rig­or­ous demands, for exam­ple, on coat­ings for meter-long off­shore cylin­ders which rust and wear quick­ly in the sea due to the saline envi­ron­ment. How­ev­er, the usu­al coat­ing process­es – hard chrome plat­ing, ther­mal spray­ing and depo­si­tion weld­ing – have their dis­ad­van­tages. Even laser depo­si­tion weld­ing has also only been able to estab­lish itself in iso­lat­ed cas­es. The most com­mon process to date for wear and cor­ro­sion pro­tec­tion has been hard chrome plat­ing with chromium(VI), but this has been includ­ed in the EU Chem­i­cals Reg­u­la­tion EC 1907/2006 (REACH) because of its harm­ful effects on the envi­ron­ment. As a result, since Sep­tem­ber 2017 it has only been pos­si­ble to use it with spe­cial autho­ri­sa­tion or approval. IHC Vremac Cylin­ders B.V. from Apel­doorn (Nether­lands), which pro­duces hydraulic cylin­ders with pis­ton rods up to 10 m in length, was con­front­ed with this prob­lem. The rods are used under extreme heavy-duty con­di­tions in exca­va­tors, off­shore plants, civ­il engi­neer­ing and heavy machin­ery appli­ca­tions. “For some time now we have been look­ing for new com­pa­nies who can apply high qual­i­ty duc­tile and hard­er coat­ings,” explains Andres Veld­man, Engi­neer­ing Man­ag­er at IHC Vremac Cylin­ders. Elec­trolyt­ic process­es are suit­able for duc­tile coat­ings, where­as high-veloc­i­ty oxy­gen fuel (HVOF) spray­ing is a pos­si­ble solu­tion for hard coat­ings. But the Apel­doorn com­pa­ny also decid­ed to look at the use of lasers. Ini­tial inves­ti­ga­tions in 2006 revealed that nor­mal laser depo­si­tion weld­ing is too expen­sive and too com­pli­cat­ed. “Nev­er­the­less, we were con­vinced that this process had a promis­ing future,” recalls Veld­man. He wasn’t wrong: the process final­ly achieved its break­through large­ly thanks to an inno­va­tion in process con­trol that enables much high­er coat­ing speeds. The filler met­al is melt­ed direct­ly in the laser beam and not in the weld pool. The result? EHLA coat­ing with process speeds of up to 500 m/min. Typ­i­cal rates pre­vi­ous­ly were 0.5 to 2 m/min. Ehla also allows much thin­ner lay­ers to be applied. Where­as pre­vi­ous­ly only lay­ers over 500 microme­tres were pos­si­ble, thin lay­ers of between 25 to 250 microme­tres can now be obtained. In addi­tion, the lay­ers are smoother and the rough­ness has been reduced to a tenth of the typ­i­cal val­ue for laser depo­si­tion weld­ing. The Dutch have already start­ed series pro­duc­tion. Now that a num­ber of projects have been com­plet­ed, Veld­man reck­ons that the process cur­rent­ly costs rough­ly the same as ther­mal spray­ing. He esti­mates that it will become cheap­er once the fin­ish­ing process­es have been opti­mised. How­ev­er, the com­pa­ny has already been able to con­vince cus­tomers in the off­shore sec­tor, for exam­ple, about the ben­e­fits of the new coat­ing. 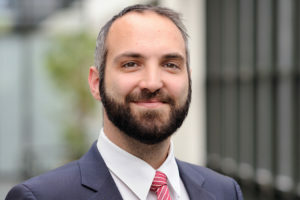 It has had Ehla cer­ti­fied to DIN EN ISO 15614–7 by Lloyd’s Reg­is­ter (LR), the risk man­age­ment organ­i­sa­tion. Veld­man: “The experts were ini­tial­ly very scep­ti­cal because we had only test­ed thin lay­ers down to 200 microme­tres in the lab­o­ra­to­ry, which were then ground down to 150 to 100 mi-crome­tres. We want­ed to make sure that the coat­ings pro­vid­ed good cor­ro­sion pro­tec­tion even after wear.” The IHC experts knew what they were doing. Since 2015, the com­pa­ny has coat­ed sev­er­al hun­dred hydraulic cylin­ders with heavy-duty, wear- and cor­ro­sion-resis­tant alloys for off­shore use world­wide, with lengths of up to 10 m and diam­e­ters of up to 500 mm. Trumpf Laser- und Sys­temtech­nik GmbH from Ditzin­gen is also aware of the large num­ber of pos­si­ble appli­ca­tions and now offers laser sys­tems which include EHLA process­es for dif­fer­ent com­po­nent sizes. The fast and envi­ron­ment­friend­ly tech­nol­o­gy is also attract­ing atten­tion out­side Europe. Chi­nese users have also start­ed using the process recent­ly. Chen Hong, Man­ag­ing Direc­tor of ACu­ni­ty GmbH from Aachen, a spin-off of Fraun­hofer ILT, explains: “There is great demand for the EHLA process because Chi­na is look­ing to reg­u­late hard chrome plat­ing based on the Euro­pean mod­el in the next two years.” Accord­ing­ly, in 2017 the spin-off entered into a strate­gic coop­er­a­tion with the Chi­na Acad­e­my of Ma-chin­ery Sci­ence and Tech­nol­o­gy Group Co, Ltd. (CAM) in Bei­jing and sup­plied a 5-axis sys­tem with EHLA noz­zle tech­nol­o­gy adapt­ed by Fraun­hofer ILT. After the suc­cess­ful projects for CAM in Bei­jing, Hebei Jingye Addi­tive Man­u­fac­tur­ing Tech­nol­o­gy Co. Ltd. ordered two sys­tems for the exter­nal coat­ing of off­shore hydraulic cylin­ders of up to five-metres in length with a max­i­mum diam­e­ter of one meter, as well as anoth­er sys­tem for inter­nal coat­ing. After the ini­tial suc­cess of the EHLA process in Chi­na, Man­ag­ing Direc­tor Hong is opti­mistic that orders for five to ten tur­bines from the off­shore indus­try will fol­low soon. This will also see a change in the pro­duc­tion method. Where­as pre­vi­ous­ly it was all about cre­at­ing tai­lor-made machines, the empha­sis now is devel­op­ing a mod­u­lar sys­tem for small, medi­um to very large plants.